Yarn spun from Treetops silk. Pattern from this book. 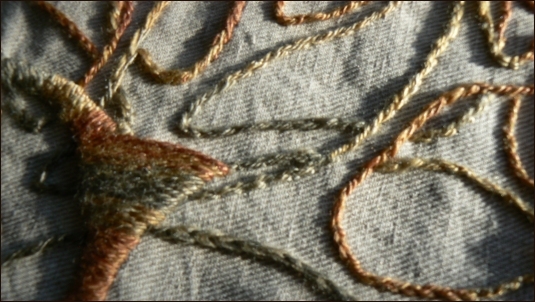 Photographer, Gale Zucker and writer, Joan Tapper collaborated on one of the best fibre-related books (in my humble opinion) to be published in 2008. If you’ve ever dreamed about owning a little a spread and caring for a few fibre-bearing beasties, Shear Spirit is the book for you. Craftlit does Dr Jekyll and Mr Hyde, beginning this month. KnitPink has calendars for sale, and not a moment too soon. Get yours, and make January “Get a Frickin’ Mammogram, You Idiot” Month. All I can do is all I can do and, yes, I am gonna play that card all month. Additional music by David Modica, courtesy of Magnatune. I’m so excited, I’ve been waiting for a new podcast for soooo loooong. I pop in on a whim and see there is a new one ready to download …and even better ? I have the first post. Well, I was going to go to bed but decided to check my favorite sites…..
Yahoo! A new Cast On!! I’m downloading even as we speak. Enjoyable podcast as always! Glad you are on the mend and not stressing yourself out with too much holiday knitting. Love the new website design also. The wait was well worth it! Thanks so much for the polished podcast! Your podcast is always a first class production. Loved listening to the saga of the red yarn and the sweater in the Riowan #44. I grabbed my copy as soon as you started talking about the sweater. How fascinating to learn how you coped with the limited yarn. First of all, I have no confidence in buying unlabeled yarn, am always afraid that I will want additional skeins in the same dye lot. I was worried about you when there was no podcast in November. I’m so glad that you are recovering. Take your time. Enjoyed the podcast. I’m glad to hear that you are doing better, and I love the new design for the site. echoing previous comments, thank-you for brightening up a typical Seattle afternoon with your soothing voice. Glad you are on the mend, I missed you. Also thanks for the music, I pruchased the Harry Potter song for my niece for a stocking stuffer. Lovely podcast!! I haven’t been able to listen for awhile and I’ve missed it. So glad I can catch it again! It is so good to hear you back and so happy! I love the silk embroidery — so swank. And the interview with the Shear Spirit gal was wonderful too! Enjoy your podcast very much. You have a great voice, I love listening and knitting. Glad you are recovering and able to carry on. My laptop screen can thank you for a newly washed look, because I totally spewed my mouthful of water all over it when I heard my voice on the most recent podcast! I’d forgotten I did that drop late one night on a whim, and nearly choked when I heard it while listening to Ep 71. Weeeeird. But neat. 🙂 I posted with a link to Susanna’s site, and she’s got a .pdf on the upcoming Bohus Stickening exhbit at the American Swedish Institute. I hope people will check it out and maybe go! Thanks again, Ms. Brenda, and I hope you’re on the mend and back to your sassy, feisty self that we all know and enjoy. Best wishes! My anxiety disorder means I HAVE to live my life by the only doing what I can do principle. My mum has ME which means it literally is her way of life. Its nothing to be ashamed of and is in fact a sensible mantra for life. 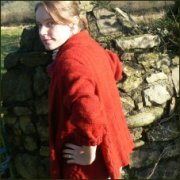 Great podcast – it was lovely listening to your podcast and finishing up a baby cardigan on the train on the way home from a weekend up north. The site looks fab too! I’m a few episodes behind (gasp), having just finished #69. In that episode you point out the slow-down in blog comments. It’s possible that someone else has pointed it out since then, but you might want to remind people to update their feed subscriptions to reflect the updated website. I just realized that my bloglines address wasn’t working at all anymore. Another wonderful podcast. I have to say, that you have had a consistently interesting and provocative podcast from the beginning. I think you hit the ground running with the podcast thing – really. And I love the new website too. The look and feel of it is amazing. It’s very soothing to look at and I love the different sections. It’s all really good. Congratulations! All your hard work shows. I very much enjoyed this podcast, as ususal. I tend to listen in my car as I drive to work, and always find myself calmer when I arrive after listening to Cast-on. I hope your healing continues without any more incidents. Glad you are back! I am saving the new episode for this weekend. Love the new look of the site! Just made my appt. for a mammo! Great podcast as always! I really missed “Today’s Sweater” and loved hearing the new one. Hope you’re well rested and full recovered! Glad you’re back on track and feeling better! Love your pod cast and NEVER miss an episode. Besides, you have THE best music on the net! Brenda glad you are back and feeling better! I have been sick this week too and I have decided to go back and listen to all of the podcasts from the first one. (As I have only been a knitter for two years.) I needless to say – have had a very Brenda week, and you have kept me company during my illness. Currently I am back in your “muse” series. Every time I hear one of the new podcast you play the promo of…that just did not make it…..it makes me glad that you have kept with it all of these years. Thank you. The website looks fantastic! I was so excited to hear the “Today’s Sweater” music and the description of your knitting adventure was wonderful. Thanks for another great episode. You asked us to let you know if you’re missing anything in the show notes. Well, I came here looking for the special code for Audible that you mentioned in your blog and it’s not here. Can you include it, please? I’d like to take advantage of their special offer. Thanks. Also, as with everyone else, thanks for the great podcast. I’d heard about Shear Spirit before and completely forgot about it. You reminded me about it and I put it on my Christmas list. I’ve recently discovered embroidery too and love it! I hadn’t thought of incorporating my yarn. I can’t wait it try. Hmmm which Christmas gift can I experiment on? Love to hear that your feeling better and it’s nice to have you back podcasting! I missed you! And the “today’s sweater” is just gorgeous!! Wanted to let you know that I really appreciate having your podcast to listen to while I finish up my Christmas knitting. I hope you have a wonderful holiday! Thank you so much for your review of the book Shear Spirit! I ordered the book immediately after listening to your podcast and have been savouring every page since it arrived. I’d have never bought it if I hadn’t heard your interview. I love your podcast and eagerly await each episode. LOVED today’s sweater, fantastic detail and a very familiar story for me 🙂 I always seem to unpick the beginnings of a project several times before I decide how it’s going to be. Heh. Hope your recovery is going well, look after yourself. Thank you for another wonderful episode. I have been listening for almost a year now, and just wanted to let you know what a joy it is listening to you. This is going on my iPod so I can listen tomorrow at work. I’m glad you are feeling better and look forward (anxiously) to the next episode!! How I loved this episode of Cast On, and your energy and enthusiasm throughout the show. I love the work, the research and the care with which you put together your shows and I really like the new website layout! Thanks for all the great work you do; I really enjoy listening to Cast On and I think the quality of the writing and the organisation of the material in the show are really great. It feels to me like you totally got your mojo back and I’m really glad you got some crafting use out of your surgery recovery time. I find that knitting is an excellent and very necessary antidote to the malaise of ill health and recuperation time. 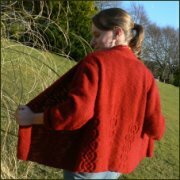 I like your use of handspun for embroidery! just thought it may be of interest to you because it maybe ties in with the recovering/resting/knitting/healing themes that you touched upon in this show. All power to your creativity and health! Just to let you know, you are the singular reason I finished my holiday knitting this year. It was the first year since I learned to knit that I decided to knit everyone’s gifts (due to economic downturn, I suppose). I sat in the mornings, before work, and knit while listening to you talking about everything, and inspiring me to get it done. You inspired me to finish: two scarves, a pair of socks, a shawl, a bath puff, a linen washcloth (a feat in itself). Thank you so much for putting out this podcast. I look forward to you talking to me over a cup of coffee each week. Many thanks for inspiring me. I just wanted to say thankyou for keeping me in such good company whilst i’ve been sat spinning these last few evenings. I was smiling to myself as I listened about your stay in hospital, as it reminded me of when I had my tonsils removed last year (At the grand age of 33 – no ice cream for me!) and how disorientated you are when you come around from the anaesthetic. We are so used to having to pick our selves up and carry on regardless with our hectic lives aren’t we, but sometimes our bodies know best! I am glad you are recovering and I hope you had a lovely christmas. I’m a relatively new listener, in the last 2 episodes (slowly working through the 3 year backlog!) I’m also a Portland area expat living in the UK, Oxfordshire here. It’s crazy how small the world is. Your podcast is really lovely to listen to and has helped me find the inspiration to get back into knitting. 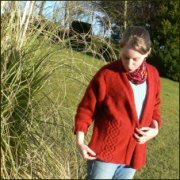 Your mention of ravelry.com in an episode has opened me up to a whole new fantastic world of knitting that I’ve been tentative to dip my fingers into. Thank you for leading me to such a fantastic place to learn and knit. Sorry to hear about your hospital stay, but very glad you’re healing and feeling better. Hope you have a lovely New Year and look forward to future podcasts. ho, uh, I mean hey!! that lamb pic is prolly the cutest thing ever!! I just moved here from NoCal…. I just listened to episode 71 today while walking (yes, I’m a little behind…). It was wonderful, as usual. Just wanted to let you know I ordered Joel Kopische’s CD “I Got Yule Babe” after hearing “A Very Harry Potter Christmas.” It’ll make a great present for my college-bound son, and it puts me ahead of the curve for next Christmas, ha! ha! Thanks for sharing, Brenda, I always enjoy your podcasts! for some reason this one won’t play. Chrome returns OK on webpage and download yields a file that won’t open w/mp* players. Any suggestions? AJ, I wish I had an answer, but I can’t seem to duplicate your issue. Here’s the path to the file: http://libsyn.com/media/caston/CO71-081205.mp3. When I copy and paste this into a browser window it either plays (Chrome) or I get a dialogue window asking where I want to save the file (Firefox). When I save the file, it opens fine in VLC (my favourite media player) What happens for you depends on your browser settings, but I can’t see a reason why you wouldn’t be able to download the file, and get it to play in Windows. the only suggestion I can offer is try VLC.